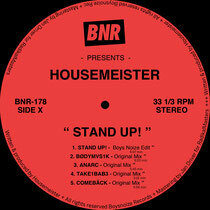 Housemeister is a Berlin DJ/producer whose works aims to reflect the city itself, which includes his latest offering, the ‘Stand Up!’ EP. The track’s five mixes bring elements of Dance Mania, EBM, ’90s techno and hot tape lo-fi minimalism. Edited by Boys Noize, title track ‘Stand Up!’ finds firm footing in Detroit and Chicago from which it winds, shifts, builds and surprises, trading the repetitiveness of its influences for an evolving six minutes. ‘BØDYMVS1K’ has Housemeister dropping a tough EBM arpeggio-led track into the mix, the only track lacking the percussive groove found on the rest of the EP, but also marking a certain energetic peak. The remainder of the EP takes you to the later hours and is also where Housemeister's drum sequencing shows. ‘Anark’ departs into maddening techno, while ‘TAKE1BAB3’ is a minimal lock-groove built around a vocal sample. The Dance Mania influence returns with the closer, ‘Come Back’, which also serves as a synthesis of the EP's wider vision. Three minutes in, a single synth and some open hats aim to lift the track to dancefloor heights.